The list of users can be filtered based on the term entered here. The selection functions lexicographically meaning when, for example, the letter A is entered, only the users whose name begins with A will be listed. Typing in more letters will restrict the list further. 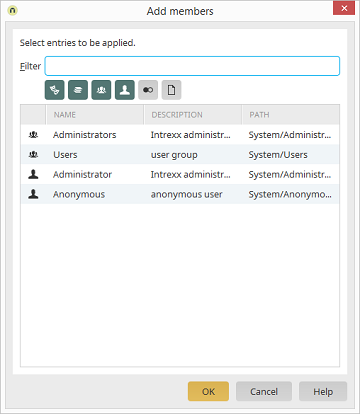 With these the buttons, the list can be restricted to the various object classes from the User Manager. Depending on which dialog is open, some filters may not be available. If you would like to select more than one member, click on each of them while holding down the CRTL key.